WASHINGTON — When 18 people died in alcohol-related crashes in his Louisiana parish two years ago, Sheriff Craig Webre looked for new ways to combat drunken driving. Using laws already on the books, the sheriff found a simple answer. Webre’s department west of New Orleans started using a “no refusal” policy for suspected drunken drivers who declined breath tests. When someone pulled over for drunken driving refused to take a Breathalyzer, Webre’s deputies sought prompt search warrants from judges to take blood samples and charge suspects if their blood-alcohol levels exceeded the legal limit of 0.08. When I read this article I was once again disappointed at its one-sidedness. First of all the article does not mention how these blood sample are attained. In reality, police will literally pinned down the DUI suspect using all force they feel is necessary and stick a needle in them against their will. Secondly, it does not mention the issue of abuse of power that has plagued these “No DUI Refusal” measures. In one instance police stomped and beat a Texas man to the point where they broke his leg to draw his blood for a DUI test. And what about the issue of the integrity of our bodies? What about the original intent of the Framer’s of the Constitution and the Bill of Rights? I think that they would start a second Revolution if they were around now. They only revolted about taxation without representation. Imagine what they would have done about invading our bodies and poking them with needles against our will! 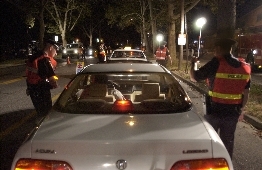 DUI enforcement is quickly spiraling out of control and endangers the lives and liberties of all of us. We in Pennsylvania can be thankful that forcible blood draws are not part of the DUI law in PA but be aware that politicians are being lobbied to enact this as we speak.